Barely six weeks after work began on the massive Starship prototype, SpaceX’s Starhopper appears to have grown to its full ~40m (~130 ft) height in South Texas. Following a preliminary fit test on Tuesday, January 8th, workers made a second attempt on Wednesday and completed the final attachment of Starhopper’s upper and lower halves. Intriguingly, no time was wasted spot-welding the halves together after their successful docking, and an additional sheet of stainless steel has been welded over the seam in the hours since then. 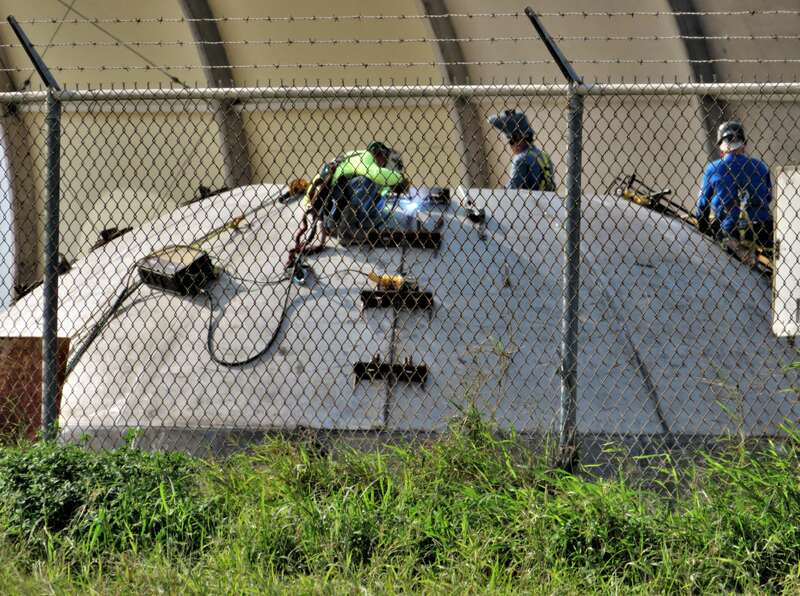 However, what looks like 9m-diameter (~30 ft) steel tank domes are being assembled and welded together at the same SpaceX facility, despite the fact that no domes have been observed being installed inside Starhopper. Musk did seem to indicate that even Starhopper – requiring far less propellant than an orbital Starship – will still feature full 9m (~30 foot) diameter tanks. 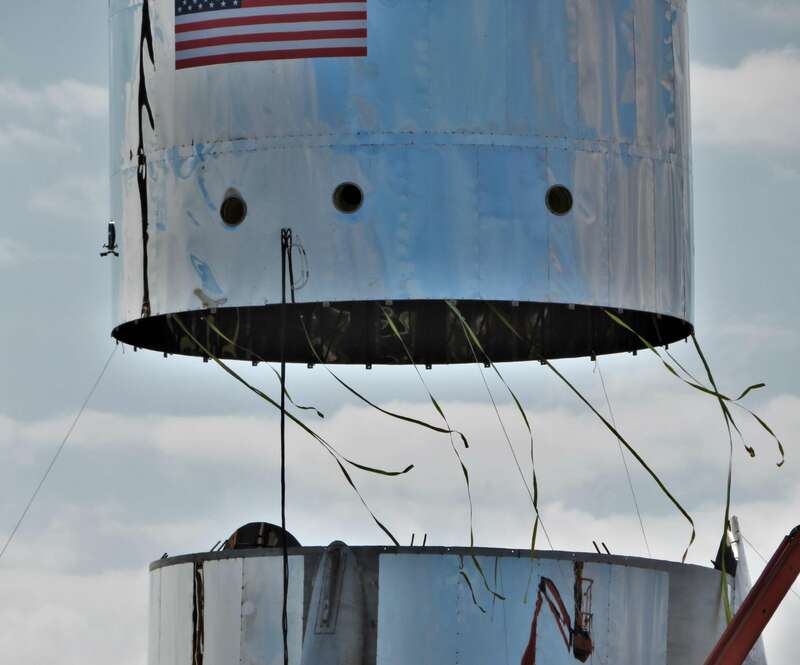 This could imply that the newly integrated Starhopper has yet to have propellant tank domes installed inside and will need to be taken apart again to allow for that critical final step. If that is not the case, the only possible explanation is that Starhopper’s propellant tanks will actually be less than 9m in diameter and will be lifted up through the vehicle’s aft for installation. One last increasingly improbable possibility is that a significant portion of the hopper’s upper half will be or already is a pressure vessel capable of holding cryogenic propellant, although the process of actually watching the less than surgical fabrication does not inspire a great deal of confidence in any potential pressure vessel aspirations. 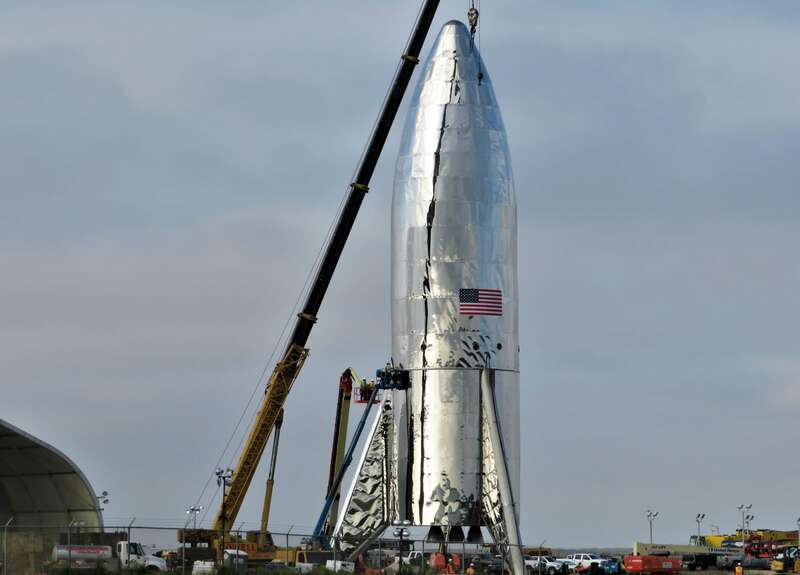 In the meantime, we have been given the first look at what the outside of Starhopper will look like once complete. 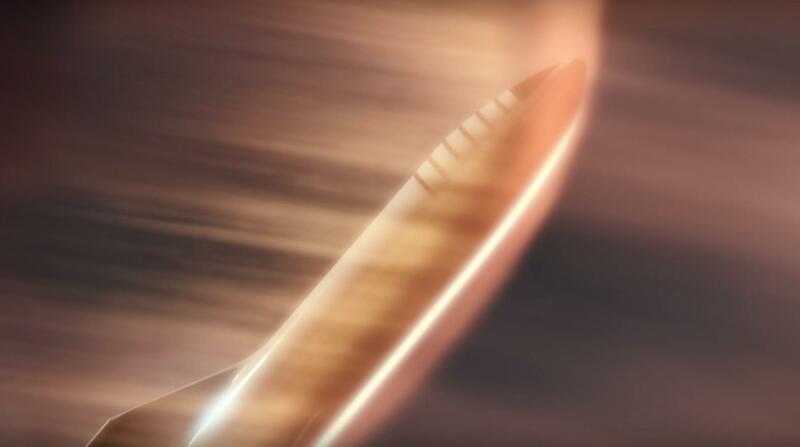 According to SpaceX CEO Elon Musk, hop tests of the imposing vehicle could begin as few as 4-8 weeks from now. Aside from offering the above photo and comparing Starhopper’s prospects to those of Falcon 9’s Grasshopper and F9R hop test articles (i.e. very suborbital and very short-lived), Musk also stated that the first orbital Starship prototype could be completed as early as June 2019, as few as three months after Starhopper’s first hop test. This paints at least a rough picture of the planning going on for BFR’s flight test regime, beginning with a suborbital hop test prototype, moving to a full-fidelity Starship capable of high-speed intra-atmospheric heat shield and aero surface testing, and finally full-up orbital testing with the completion of the first BFR booster (now known as Super Heavy). According to Musk, the first Super Heavy booster will begin production and assembly as early as spring 2019, while the CEO stated that he believed the odds of BFR (Starship/Super Heavy) reaching orbit by 2020 were 60% and “growing rapidly” thanks to a recent move from carbon composite tankage to stainless steel. If SpaceX and Musk keep putting their money where their mouths are and rapidly building test articles and prototypes, that orbital debut might actually be less insane than it sounds. We’ll find out soon enough. 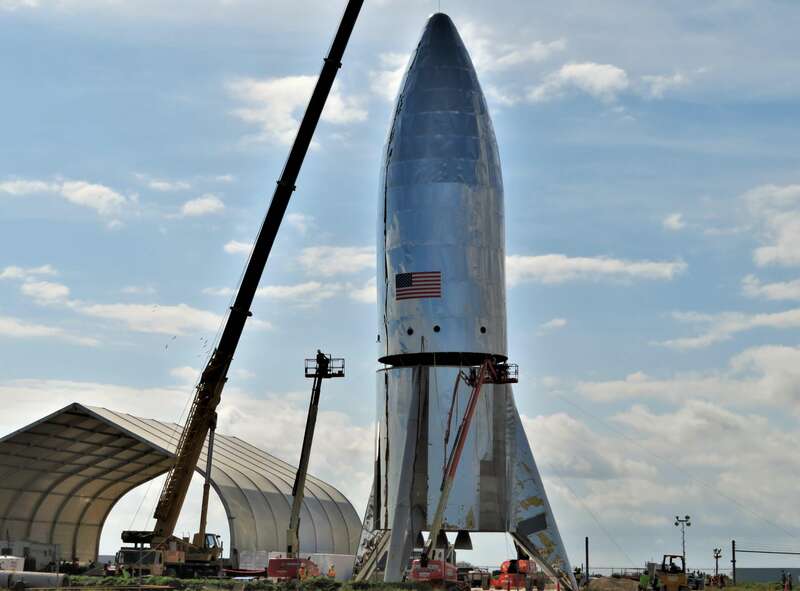 The post SpaceX CEO Elon Musk says first orbital Starship prototype will be done by June appeared first on TESLARATI.com.